at 199 Line Road, Malvern, PA 19355. While most sessions take place in an indoor arena, please make sure to dress appropriately for the weather as the arena is neither air-conditioned nor heated. Please wear close-toed shoes, and refrain from wearing loose jewelry. If you have allergies, we suggest you take your allergy medication before you come to the farm. Please bring any emergency medications with you that you require such as epi-pens, inhalers, etc. Each session or group of sessions depends on how many people are in each session and how many sessions you or your group require. Please contact us to learn more kristen@gatewayhorseworks.org or 484-433-9911. If you are unable to afford our services, please contact us to learn more about financial aid or to apply for a scholarship. What if I’m afraid of horses or have no horse experience? Many of our clients come to us with little or no horse experience. Because of their lack of experience, or negative experiences with horses in the past, it is natural for them to be unsure or afraid. That is why there is a certified Equine Specialist in every session whose main focus is to provide physical safety for horses and humans in every session. All the horses used in our sessions have been screened for their temperament and health. While it is important to know that working around horses carries a certain amount of risk, we believe the benefits of working with horses outweigh the risks. 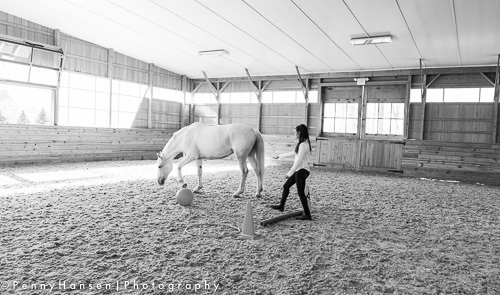 Many who come to us afraid of working with horses find great power in overcoming their fears. This experience can help clients reform their beliefs about some of the seemingly insurmountable challenges they are experiencing in their own lives, and the experience can become a platform of resiliency and hope. Do I need to be in talk therapy to attend a session with the horses? No. Equine Assisted Psychotherapy can be an effective stand-alone therapy. If you are involved in traditional therapy, Equine Assisted Psychotherapy can be a wonderful compliment. Pending release, our therapists can partner with your providers to create a continuity of therapy. Unfortunately, we do not accept insurance at this time. Upon request, our therapists can provide a receipt that you may submit for reimbursement with your insurance company. Contact us to learn how you might qualify for financial aid or to apply for a scholarship. Is there any research being done on Equine Assisted Psychotherapy? Yes! There is exciting research happening all over the globe. Gateway HorseWorks is partnering with West Chester University to conduct cutting-edge research in the field of Equine Assisted Psychotherapy. Contact us or visit www.eagala.org/research to learn more. ﻿Feel free to contact us if you have a specific question or need more information!